This is a reprint of my review which was published on this blog in December 2014, with a number of significant revisions. That version of the review can be found here. 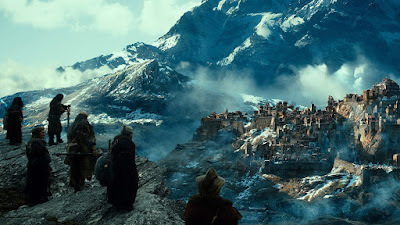 In my original review of the first Hobbit film, An Unexpected Journey, I concluded by saying that we couldn't entirely judge it without the context of its subsequent sequels. I spent a lot of my review (in all versions of it) addressing audience expectations of the film rather than reviewing the film itself, at least not as directly as perhaps I would normally. As I explained, this was necessary in dealing with a lot of the baggage that comes with all the comparisons made with The Lord of the Rings, which the film inevitably invites. 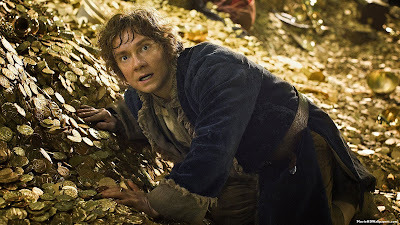 With The Desolation of Smaug (Desolation hereafter), we are now able to get a more accurate picture of the artistic and narrative intentions of the trilogy. The sequel to An Unexpected Journey does bring a number of small improvements to the table, teasing out a little more subtext from the novel and solving some of the tonal problems. But it's still encumbered by the same narrative flaws of the first film, which the higher stakes unfortunately amplify, resulting in an ultimately underwhelming experience. On the good side, the film seems tonally a lot more sure of itself. One of the big problems with An Unexpected Journey was its flipping back and forth between the light-hearted frolics of The Hobbit itself and the darker, more serious matter gleaned from The Lord of the Rings appendices. 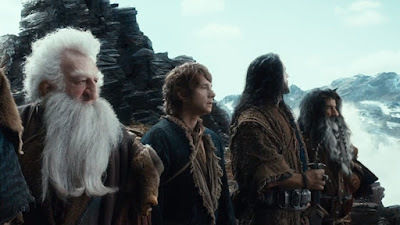 Here, there is the underlying feeling of a gathering darkness, reflected in both the journey of the dwarfs and Gandalf's investigations of the Necromancer. The success of this latter section could also be used to justify Jackson's decision to draw on the appendices in the first place - but we shall come to that a little later. 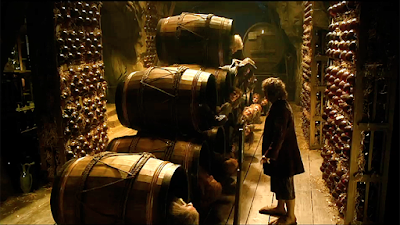 There is a political point in all of this too, illustrated by the position of the Mirkwood elves. The aloof isolationism practised by their leader Thranduil is contrasted by Tauriel's compulsion to intervene in other peoples' wars. The community is faced with a stark political choice: either they shut themselves in from the growing evil and hope to withstand it, or they actively fight against it to safeguard an unknown future. Thranduil is a character shares some traits with Theoden from The Two Towers, particularly his decision to retreat to a place of safety rather than "risk open war". While both ultimately join the fray, Theoden is redeemed through his efforts to combat his own guilt and shame, while Thranduil's pride taint his contribution and he ends up losing those closest to him. In addition to there being more subtext, Desolation also benefits from somewhat better pacing. 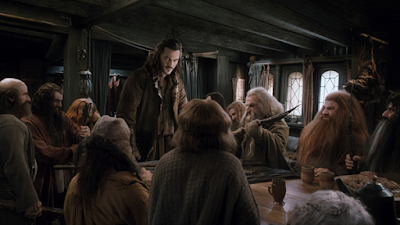 The first film badly dragged in a way that The Fellowship of the Ring did not, possibly because it took a long time to adjust to Jackson's approach with weaving in the extra material. This film, by contrast, starts off very briskly and keeps the pace up more consistently. Even though it's still much, much too long, we aren't quite so conscious of it this time around. As with the first film, the set-pieces in Desolation are generally good. They do have more of a video game sensibility than their Lord of the Rings counterparts, being shot more from a first-person stance and with more unusual camera angles. But Jackson still has a knack for creating interesting character pains and deaths, something in which he has excelled since the days of Bad Taste and Brain Dead. 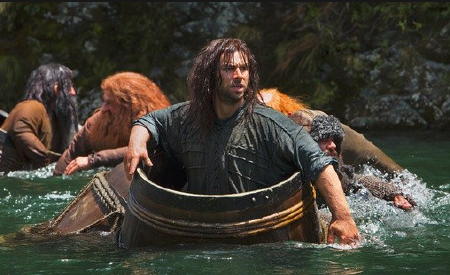 The barrel sequence is especially fun, particularly Bombur's antics of rolling between the banks of the river while taking out a multitude of orcs. One of the big tests of Desolation was going to be the introduction of its title character. This could have been very disappointing: notwithstanding the silliness of the Rankin Bass version, the darkness of the Lonely Mountain could have deprived us of his beauty, just as many (wrongly) held that Baz Luhrmann's editing in Moulin Rouge! deprived us of seeing the spectacular sets. But Jackson does a very good job, aided by Benedict Cumberbatch's sinister if operatic performance. 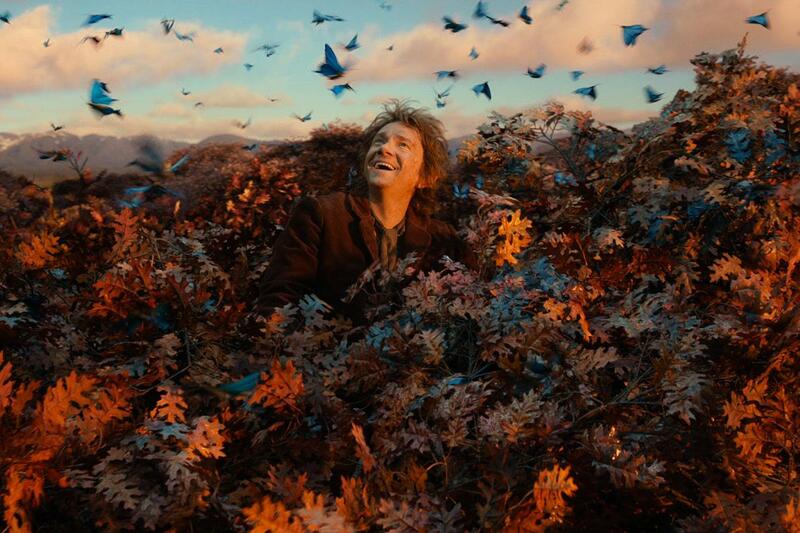 While Smaug himself may be stupendous, however many of the other effects are not. Too many of the wide shots and battle sequences are all too obviously green-screen, in that they consist of actors running around somewhat aimlessly, looking for their marks and trying to use their imagination. It's hard to say whether the increased use of green-screen was a creative decision on Jackson's part or a studio mandate to keep down the already huge budget and make up for lost time. Either way, these scenes lack the physicality of the battles in The Lord of the Rings, and the molten gold in the climax is so depressingly fake-looking that you wonder whether George Lucas had sneaked onto the set. Another big problem with Desolation is that the romantic element simply doesn't work. Tolkien reportedly tried towards the end of his life to rewrite key parts of his books in order to make the female characters more active. While the filmmakers can therefore claim to be enacting his wishes in a broader sense, Tauriel as a character is poorly written. Notwithstanding her political symbolism, she comes across as a Mary Sue, seemingly capable of everything and perfect in every way, and whose dialogue often resembles fan fiction. Her relationship with Kili doesn't go anywhere, nor does it successfully convey the message about the need for closer ties between the races. Criticisms like this all point to an underlying question: would it have been better to just give us The Hobbit, on its own with none of the appendices, and let it be a lesser film? 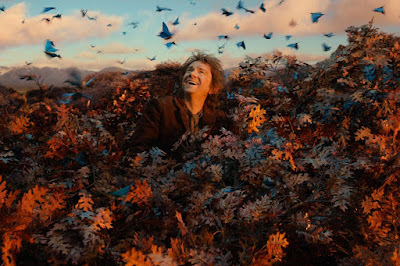 The Hobbit is by its very nature a weaker story than The Lord of the Rings, and trying to make it closer to the latter by filling in gaps in the lore is good for fans but not so good for storytelling. Perhaps it would have been better to do as was originally envisioned by Jackson and Guillermo del Toro, namely to create a very different universe in one film and then bridge that universe with Jackson's in another. The Hobbit: The Desolation of Smaug is a heavily flawed second instalment of a trilogy which is a shadow of its predecessors. There's still a great deal of fun to be had watching it, and it contains some improvements which should be celebrated. But all these improvements are ultimately overbalanced or overshadowed by a number of big, silly flaws. It's watchable but unmemorable, and given the richness of Tolkien's universe, that is arguably its greatest crime.